Moore speaks to the media Thursday. MONTGOMERY, Alabama (CNN) -- The Alabama chief justice locked in a fierce battle with a federal court vowed Thursday that he would not remove a monument of the Ten Commandments from the state's judicial building's rotunda. In a fiery speech given just six days before a federal deadline to remove the monument, Chief Justice Roy Moore said he would take his case to the U.S. Supreme Court. "I have no intention of removing the monument of the Ten Commandments, the moral foundation of our law," he said. "To do so would, in effect, be a disestablishment of the justice system of this state. "The question is not whether I will remove the monument," Moore added. "It is not a question of whether I will disobey or obey a court order. The real question is whether or not I will deny the God that created us." Earlier this month U.S. District Judge Myron Thompson set an August 20 deadline for the 5,300-pound monument's removal and suggested he would impose hefty daily fines against the state if Moore fails to comply with the order. Thompson said the monument's presence on public property violates the federal Constitution's ban on government promotion of religion. Moore accused Thompson of "abuse of power," "callous disregard to the people of this state," and "threatening to drain huge amounts of public funds from the state of Alabama," because of the cost of the ongoing legal battle. The controversy over the monument stems from a lawsuit filed in October 2001 by three organizations on behalf of three Alabama lawyers who often had business at the judicial building and said the monument offended them. 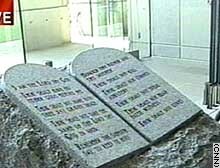 Moore had the monument moved into the building's rotunda on July 31, 2001, saying that the Ten Commandments represent the moral foundation of American law. Last year Judge Thompson ruled in favor last year of the attorneys opposed to the monument's presence on public property. Moore appealed the decision, but in July the 11th U.S. Circuit Court of Appeals in Atlanta, Georgia, ruled unanimously that Moore violated the constitutional separation of church and state by installing the monument. The Ten Commandments monument inside the rotunda of Alabama's Judicial Building. The court's ruling compared Moore to segregationist Southern governors of the past who refused to integrate college campuses even after federal court orders to do so -- and predicted that if Moore appealed to the U.S. Supreme Court he would lose. Moore said Thursday that he would turn to the nation's highest court. He said on Friday he will file with the U.S. Supreme Court a motion calling on Thompson to halt his "wrongful interference of state government." Moore said he will file the motion "to preserve our rights as a state and nation to acknowledge God." "Separation of church and state never was meant to separate God from our government. It was never meant to separate God from our law," he said. The First Amendment's "very purpose is to allow us the freedom to worship Almighty God. That freedom is being taken from us by federal courts who misuse the First Amendment to take away our rights instead of as a shield to preserve them for us." 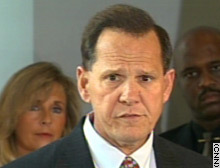 Moore said he will take on other state officials who stand by Thompson's decision. "Each of them has also taken an oath to uphold the Constitution of the United States." Moore has long been associated with the Ten Commandments. When he began his judicial career at a circuit court in Etowah County he hung a hand-carved, wooden plaque of the Ten Commandments behind the bench in his courtroom. During his campaign for the chief justice position in November 2000, his campaign committee ran television and radio commercials and posted billboards calling him the "Ten Commandments Judge."